Professor Cath Noakes, Director of Research and the Faculty of Engineering’s Athena Swan lead, is based in the School of Civil Engineering. Her passion for indoor air quality, airborne infection, ventilation, computational fluid dynamics, building performance, fluid dynamics, building physics and building services have stunningly collided into the ReFresh project. With colleagues from the University of Reading and the University of Southampton, the research team is looking at remodelling building design sustainability from a human-centred approach. ‘We’re looking at how the design of the urban environment affects ventilation into buildings and then how ventilation affects the people inside.’ The five-year ReFresh project is funded by the Engineering and Physical Sciences Research Council (EPSRC). It aims to build evidence-based, robust, dynamic models of human-building interactions through a multi-disciplinary approach by dealing with the globally important question: ‘Do poor quality indoor environments negatively impact occupant cognitive performance?’ The goals of this large-scale and complex project are to put the human at the centre of building performance and to develop new measures and models that better capture the complexity of these interactions. The key question being: ‘How can we design buildings that are sustainable and energy efficient as well as an optimum working environment for occupants?’ This project is measuring the dynamic changes in and around the local environment on human performance in that environment. These measures will give ways to create new models of building environments that in turn will be available to help inform policy for building quality that takes human wellbeing in these environments into account. These models will also help in the design of new kinds of environmental interaction tools. Experimental work at the University of Reading headed up by Janet Barlow, Professor in Urban Meteorology and Director of the Technologies for Sustainable Built Environments Centre, is looking at full scale modelling of a building and using hay bales to represent other buildings. The team is also conducting wind tunnel experiments. Professor mc schraefel’s team at the University of Southampton is looking at the people inside the buildings. With expertise focusing on human factors/human computer interaction with emphasis on IT design over large-scale data sets to support knowledge building she’s well placed to examine how the performance and productivity of human participants under different ventilation conditions. The research is already bringing important new insights into the airflows in urban environments and how neighbouring buildings have a significant influence on the ventilation rate and airflow patterns in rooms with opening windows. 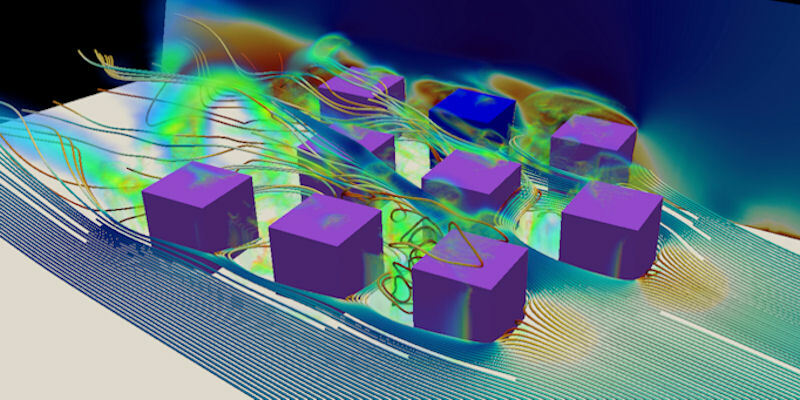 The team have been able to model the airflow patterns around buildings and use this to understand how changes to the city layout and wind direction affect the local flow patterns. These findings are important to architects and engineers who design buildings or plan cities as they may help them to more accurately predict the airflows outdoors and indoors. Over five years between 2013 and 2018, the impact of the urban microclimate on building ventilation will be explored thanks to an Engineering and Physical Sciences Research Council grant to the value of £1.7M.